Read the Latest Edition of GPC’s Annual Report. Every Acre, Every Member, Every Dollar Counts — Look at what we are accomplishing together! As a team of concerned community members, we are saving salmon, orcas, eagles, and bears. Together we are protecting forests, streams, shorelines, and community greenspaces for wildlife and people. Tap the image above to download the complete edition. Please note you must have Adobe Reader installed on your computer to view these files. Click here to download the free Adobe Reader. Great Peninsula Conservancy is incorporated in the state of Washington as a private, non-profit corporation. We are recognized by the IRS as a 501(c)(3) tax exempt organization. Donations to Great Peninsula Conservancy are tax deductible to the full extent of the law. Our Tax ID is # 91-1110978. We encourage you to browse through our latest financial documents to see how we are doing. 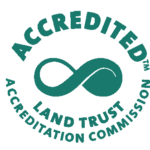 Learn more about our goals and visions for land conservation now and into the future. Download a copy of our complete 2016-2020 strategic plan.